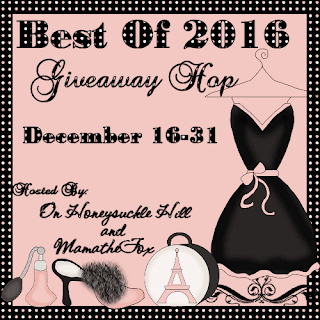 Welcome to the Best of 2016 Giveaway Hop hosted by MamatheFox! At each stop in this hop, you can find a fun prize to enter to win. 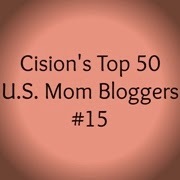 Come back for your daily entries on each blog to increase your chances of winning! I love finding unique products and SnoSpice definitely fits that description! SnoSpice blends contain herbs, spices, and nothing else - no sugar! Each flavor is designed to play on the sweetness already present in milk to make ice cream much more flavorful without anything sweet. They are ground to fold perfectly into plain flavors of homemade ice cream, coconut gelato, and vegan smoothies. 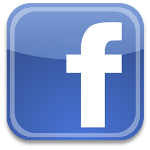 SnoSpice is so easy to use! Just grab a bowl of vanilla ice cream, shake your favorite SnoSpice mix onto the ice cream, stir it in, and enjoy a taste like no other. You can shake in as little or as much as you'd like and you can even shake a bit of extra SnoSpice on top if you want. This is a great way to have lots of flavors of ice cream, and with only a single carton of vanilla ice cream taking up space in the freezer. Think of all the fun ice cream socials you could host with SnoSpice! There are currently six SnoSpice flavors available, with even more in the works. I received four of them - Cinnamon for Optimists, Pumpkin Carriage, Lemon + Basil, and Turmeric'd. Also available are Cocoa Cayenne and Deep Chocolate Sea Salt, which you know means I'm going to have to buy the other two to add to my collection! You know you're living the good life when you need to eat four bowls of ice cream to write a blog post! First I tried the Cinnamon for Optimists. I love cinnamon so I added a whole bunch of SnoSpice to my bowl and stirred it in. I discovered that it's easiest to stir using two spoons to work the flavor into the ice cream without the ice cream sticking to your spoon. I don't think I've ever had cinnamon ice cream, and it was so good! Next, I tried the Pumpkin Carriage SnoSpice. It's absolutely scrumptious! My husband says this SnoSpice is his favorite flavor. SnoSpice is also a great way to add flavor to milkshakes and I'll bet this flavor makes an incredible pumpkin milkshake. Top it off with a few chocolate chips and I'd be in heaven! I might even try SnoSpice in yogurt and see how that tastes too. I was a bit wary about the Lemon + Basil flavor. I just could not imagine how ice cream would taste with basil in it. But in reality, you know I'll try anything once, so I loaded up my vanilla ice cream with the Lemon + Basil and dug in. It's absolutely delicious and this flavor is my favorite! I also really liked the Turmeric'd, and I can't wait to try the two chocolate SnoSpice flavors. The SnoSpice Gift Sets would make wonderful holiday gifts! 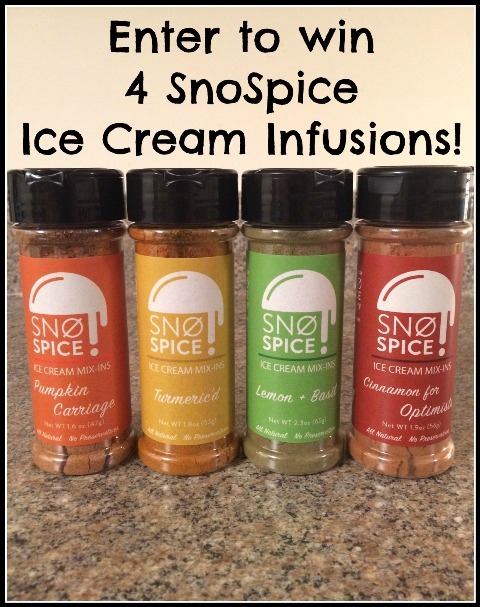 Enter to win 4 SnoSpice Ice Cream Infusions! To enter, just fill in the giveaway form below. 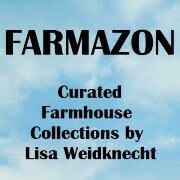 Giveaway is open to US residents, ages 18 and up. One winner will receive 4 SnoSpice mix-ins. Giveaway ends on 12/31/2016. Good luck! 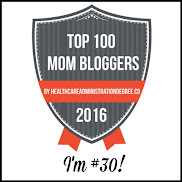 Disclosure: MamatheFox and all participating blogs are not held responsible for sponsors who fail to fulfill their prize obligations. I love that they are all natural and contain no sugar!! I like that they use all natural herbs and spices. Just like the Colonel! I like the Deep Chocolate Sea salt. I learned they're all natural! I like that Sno Spice contains no sugar. SnoSpice is available with free shipping! What a great deal. I like that there's no sweeteners. I've never heard of putting spices on ice cream before this. It sounds really interesting though. I learned that they are all natural and contain no sugar. I learned that they are all natural and contain no sugar! They also now have a 7th flavor - Matcha Green Tea!! It is all natural and no sugar added!!!! I learned and really like the spices are natural and much healthier for us. I love that they are ground to fold perfectly into plain flavors of homemade ice cream, coconut gelato, vegan smoothies. They sound so good and we eat lots of ice cream all the time. Create a refreshing Lemon Basil Sorbet. One of the most intriguing SnoSpice flavors, this delivers a delicious citrus basil flavor with a sharp zip. Because herbs and spices tend to be good for you, we were excited that ice cream could be (slightly) healthy and be a way to fit Cinnamon and Turmeric into the daily diet. I see there's a Lemon Basil SnoSpice. That sounds unusual! I like that they grind matcha green tea into a powder fine enough to turn ordinary vanilla ice cream into green tea ice cream. And I would love to try the Match Green Tea product. You can send amazing ice cream flavor as a gift anywhere with free shipping! Such a great idea! You can turn regular ice cream into gourmet flavors!